Use this recipe to substitute your processed protein bars! They are protein filled that only contain whole food ingredients to help you reach your health and fitness goals. These brownies are ridiculously simple to make. They require a handful of ingredients you likely have on hand (and if you don’t click on the links below to have it delivered to your door the next day), and all you need is a food processor (or a blender) and a muffin tin. Preheat oven to 350F. Using a food processor, high-speed blender, or handheld mixer, combine all ingredients together until smooth (excluding optional toppings). Consistency should be similar to chocolate frosting. Add a tablespoon of water if needed, but avoid making the batter runny. Transfer batter into a nonstick muffin pan. Optional to top with nuts or cacao nibs. Bake for 20-25 minutes, or until the edges of the muffins begin to pull away from the sides of the pan. Allow brownies to cool for 30 minutes. *To make this Gluten-Free Recipe Vegan. Use Flax Eggs: To make one flax egg, combine 1 tbsp. ground flax seeds with 2 tbsp. of water in a small bowl. Let sit for 5 minutes before adding to recipe. Place an amazon order right now with the below links! Go through your pantry right now and click on anything you don’t have! 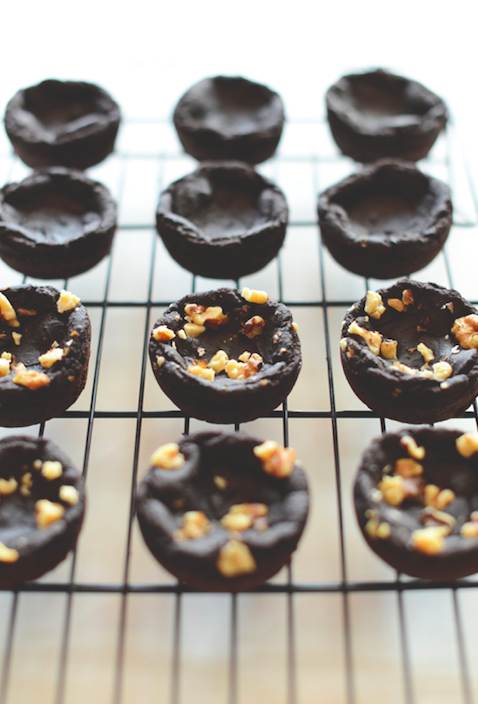 Please don’t let anything hold you back from making this delightful and healthy treat! This is a rough estimate for 1 brownie without toppings.